ORAU Health Physics Historical Instrumentation Collection part of new exhibit in D.C. Anxious curator sends more than two dozen rare artifacts from ORAU collection to National Building Museum exhibit on America’s ‘Secret Cities,’ opening May 3 in Washington, D.C.
OAK RIDGE, Tenn.—When Paul Frame, Ph.D., is in Washington, D.C. on May 1, he expects to be nervous. No, he’s not testifying before Congress or bringing a case before the Supreme Court. Rather, Frame will be checking to make sure the artifacts he sent to the National Building Museum are accounted for and on display. “I want to make sure everything arrived in one piece and didn’t get lost,” he said. Frame, a health physicist who managed professional training programs and has taught health physics at ORAU for more than 36 years, is the curator of the ORAU Health Physics Historical Instrumentation Collection. The collection is a rare and wide-ranging assortment of artifacts related to the scientific and commercial history of radioactivity and radiation. More than two dozen items from the collection were requested by the National Building Museum for inclusion in “Secret Cities: The Architecture and Planning of the Manhattan Project,” which officially opens on May 3. Frame and Sarah Roberts, ORAU vice president for Health, Energy and Environment, will be on hand for a sneak-peek event on May 1. The most valuable item among the group of health physics artifacts to be displayed in the Secret Cities exhibit at the National Building Museum is the U238 Atomic Energy Lab, a chemistry set for kids produced by the Gilbert Company in the early 1950s. Among the items sent to D.C. are posters from the movies The Atomic Kid, starring Mickey Rooney, and The Gamma People, starring Paul Douglas and Eva Bartok. Also sent were examples of glassware and Fiesta ware, which had detectable amounts of uranium oxide in its red glazes, and a piece of roof tile from a home in Hiroshima, Japan, which was blistered by the heat of the atomic bomb dropped over the city in 1945. There is also a copy of the first edition of Le Radium, a scientific journal founded by Marie Curie, famed Polish physicist and chemist who conducted pioneering research on radioactivity. 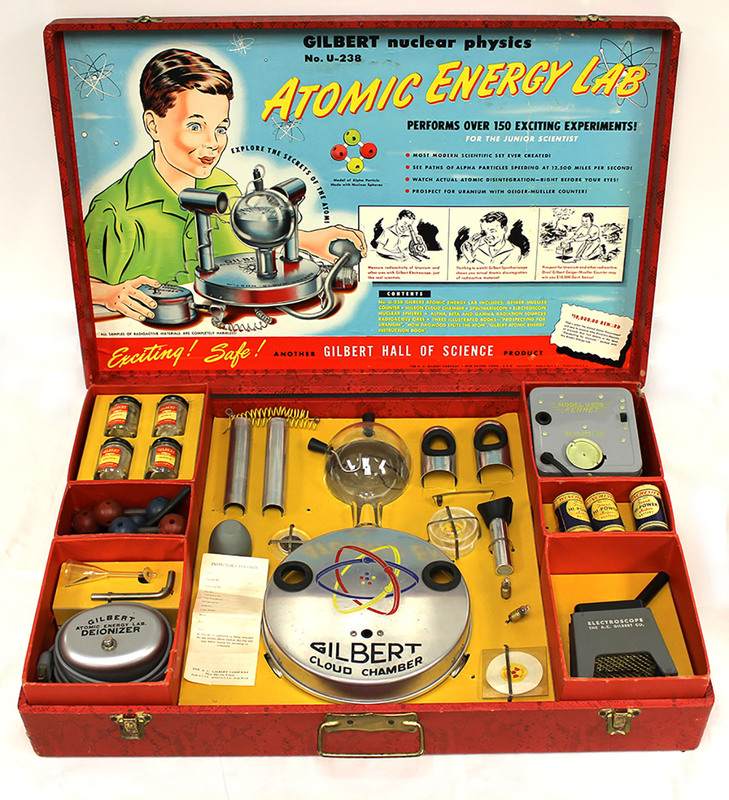 The most valuable item sent for the NBM exhibit is a U238 Atomic Energy Lab, a chemistry set for kids produced by the Gilbert Company in the early 1950s. The set contained uranium ore, which was relatively harmless to handle. The set originally retailed for $50, which Frame said was a hefty price to pay for what essentially was a toy. Today, Frame estimates the set would sell online for $7,000 to $9,000. One of the pieces in the set is a gas cloud chamber, which is extremely fragile. The ORAU Health Physics Historical Instrumentation Collection began in 1986, shortly after Frame joined the training program, when he discovered some early x-ray tubes hidden away in a closet. He was allowed to get a display case and showcase the tubes along with a few other items. While ORAU’s director of professional training programs at the time told him “don’t get any ideas” about growing the collection, things took on a life of their own. Shortly after the first display went up, a student in one of PTP’s health physics courses donated a Revigator, which is a radioactive water jar. An additional display case was needed, and the collection continued to grow from there. While the collection is not available for public viewing it can be seen online at www.orau.org/ptp/museumdirectory.htm. While the collection is fun, it also has practical value. The collection can be viewed online, which has helped people in the health physics and nuclear industries identify items they have, and those people have made a point of letting Frame know how helpful the collection was to them. Frame will be checking on the status of the ORAU collection’s items while he tours the “Secret Cities” exhibit, but he doesn’t expect to truly breathe a sigh of relief until all the items are returned after the exhibit’s 10-month run.